I feel like sandwiches are one of those polarizing foods. Maybe not so much like foie gras or durian, but there are definitely two camps: sandwich lovers and sandwich take-it-or-leavers. 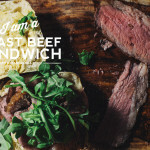 I’m a sandwich lover: I love their portability and how their possibilities are endless. Sandwiches can be as simple as a classic grilled cheese or as dressed up as an over the top porchetta. This a simple recipe (can I even call it a recipe?) that makes my tastebuds do the happy dance. 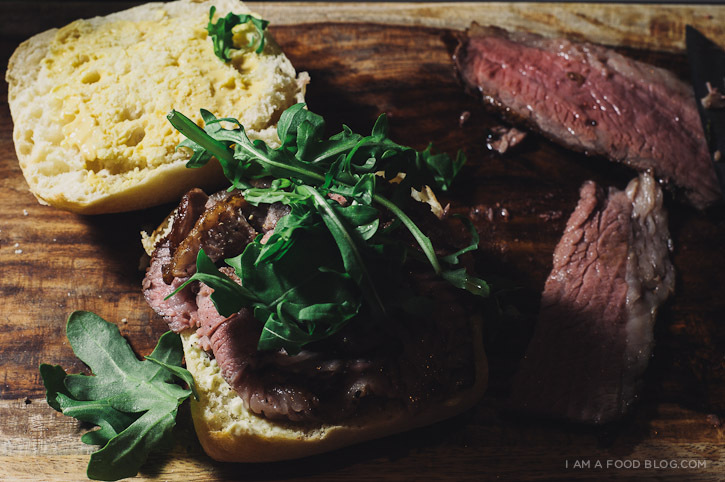 Juicy roast beef, a little kick from a smidgen of wasabi mayonnaise, mustard and peppery arugula all on good bread: I’m just a little bit in love. 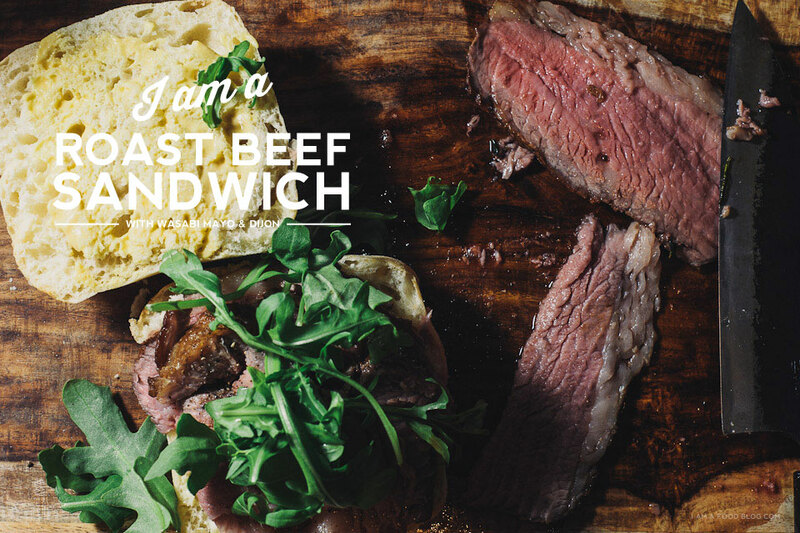 i am a classic, i am dressed up: i am roast beef with wasabi mayo! Toast your ciabatta buns for maximum crunchy outsides and soft insides. Wasabi mayo goes on one side of the bun and dijon mustard on the other. 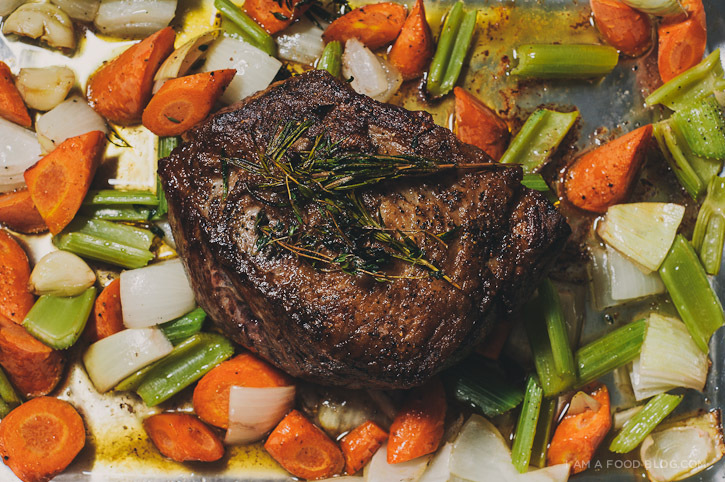 Layer on your roast beef and top with a healthy handful of arugula. Sprinkle on some red pepper flakes if you love spice. Enjoy! *I bought my wasabi mayo from Trader Joe’s, but you can stir some horseradish into mayo for a similar taste. PS – Where do you stand on foie, durian and sandwiches? Foie gras can just disappear quietly, and durian, as in the fruit? If so, same as foie gras. Don’t think they’ll be missed much. Holy hell, that looks amazing. can you do a post on how you take you food pictures? they are amazing! You cant imagine how I love roast beef, but the wasabi mayo part, I don’t know. I have to give it a try. That looks amazing, love wasabi and roast beef, good mix. omg i just cant stop scrolling and drooling your blog and food!